Seventeen-year-old Sarah Midnight's parents are dead. Everyone else thinks it's an accident - but she knows the truth. Because her parents were demon hunters, and her dreams helped her guide them from the safety of her bed. But they didn't train her for what would happen when they were gone - and if she doesn't master her powers, and learn who she can trust, she might be the next to die. Can she live up to the Midnight motto, Don't Let Them Roam? As paranormal novels go, this is definitely one of the most ambitious! We get a bunch of Secret Families, magic, demons, romance, action, and an amazing number of points of view. While the main narrative is told in the third-person, following Sarah, we get some first-person chapters from a whole bunch of characters - heroes, villains, and some I'm still not quite sure of. This is a fascinating choice of style, and I'm really impressed with how well Daniela Sacerdoti makes it work, actually. You'd perhaps expect the amount of shifts to be jarring, but they never are, and she captures the voices of so many different people very well. It particularly pays off when we get inside the heads of the two love interests, both really good characters. Yes, that's right, there's a love triangle which doesn't make me want to strangle anyone involved - miracles do happen! It helps that Sarah herself is instantly likeable and sympathetic. Another really strong point is that the stakes feel suitably high. There's one death which took me completely by surprise, while the entire last third of the book or so has a huge amount of tension. We also end at a point which will have you desperate to see what comes next... more about that in a minute. I have to also praise Sacerdoti's world-building, which is excellent and creates a compelling mythology without ever dumping too much information on us. That said, it's not quite up there with my favourites in the genre - the plot as a whole is rather confusing at times, although I always got the general idea of what's going on, and I'm sure it will get easier to follow in the next couple of volumes of the trilogy. On a similar note, the cliffhanger at the end is, as I warned, absolutely massive - I can cope with this myself, but I can see some people being annoyed by it as there seem to be an awful lot of things which are left unresolved until the sequel. Overall, I'd certainly recommend this to people looking for a new paranormal series to enjoy - although if you ARE easily irritated by cliffhangers, it may be worth waiting for the next two books to come out and reading them all at once. 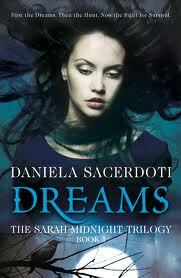 Daniela Sacerdoti has been kind enough to be interviewed by me for the blog - check it out soon! Great review! I just finished this one last night and loved it but agree that the cliffhanger is massive and I am dying to read the next book! If the death you are talking about it the one im thinking about it really shock me too, never expected that would actually happen! !